I felt compelled to finish this series even when I thought I’d already finished it. I read the rest of the series a couple of years ago when I was already reaching my tolerance of YA/NA ridiculousness so I was glad this featured slightly older characters. They’re 24ish and come across some basic and common real life adult issues. This was an ok story. I’m glad there was absolutely no OP drama, but I was a little bored. Jace, the H, turned out to be a really stand up guy and that made me happy fo I felt compelled to finish this series even when I thought I’d already finished it. I read the rest of the series a couple of years ago when I was already reaching my tolerance of YA/NA ridiculousness so I was glad this featured slightly older characters. They’re 24ish and come across some basic and common real life adult issues. This was an ok story. I’m glad there was absolutely no OP drama, but I was a little bored. Jace, the H, turned out to be a really stand up guy and that made me happy for Pepper. She is awesome. The writing style just isn’t my favourite and I had a hard time connecting because of that. Overall I’m glad I read it just to see the MCs get their HEA. Wow! I can't believe that this is the actual, real deal, final book in the Pepper Jones series. Ali Dean sure did take us on an emotional roller coaster on this one. I felt almost every single emotion in this one. The writing is amazing and the story line even better. I fell in love with Jace and Pepper and their love story all over again. I really hope that this author publishes some more novellas for this couple! There is nothing like a series “closer” (you never know what could happen, but they seem wrapped up and forever happy now). The goodbyes are always bittersweet, and the book never feels quite long enough and yet for Pepper and Jace my heartfelt content. This series is special. It spans YA-NA, and the transition was extraordinary and smooth. Like a true progression/aging of a person. Nothing would have or could have prepared me for the heartache they go through despite having a deep understanding of it myself. However, I appreciated something that effects so many ladies in this book world being brought to life in such a realistic way despite this being a fictional story. I cried with Pepper, and I felt the weight of Jace’s thoughts and emotions weighing on every part of me. This book despite the beautiful HEA/epilogue is a tearjerker. Pepper has always been a character to admire. She is steadfast, loyal, and a fierce competitor. It was difficult to see her hurt so badly again, but as always, she sets the pace on how to bounce back with grace and dignity despite the awful circumstances she had in this book. Pepper Jones Wilder is indeed a phenomenon. Jace. Always protecting and lovingly controlling situations to help his family succeed. This hasn’t changed, but he has displayed how emotionally available he has become to/for Pepper, and that is the best arc for his character. He has proven how multi-dimensional he is as a character throughout the series. I am going to miss Shadow Lane and will often be revisiting. The characters and secondary characters will always be an extension of my book family. I’m so happy I read this series. It’s unexplainable how much I loved everything about this story. This last book was unbelievably amazing. I fell in love all over again for this couple. After everything they went through, Pepper grew up to be a confident and strong woman. She did not care about the snakes bullies of the past or the new ones from. She faced everything with her head up. And their marriage only got stronger despite everything that was thrown their way. I loved it. The epilogue was one of the most beautiful things I’ve ever read. It left me with a smiley face and butterflies in my stomach. There was so much love and so much strength between them, it’s inspiring. Never thought I’d love sports romances so much. I’m so glad I read this series. It’ll forever be one of my favorites now. It’s no surprise that I fell in love with Pepped Up & Wilder! I’ve reread this series so many times and I adore Ali Dean for giving us this book. Pepper and Jace have grown so much and their strength grows even further in this book. I dreaded the book ending because I didn’t want to leave these characters. I even bought all the books in paperback so that I can continue to snuggle up and read them whenever I want; I suggest you do the same!!! When I finished Pepped Up Forever I felt like I needed more of Jace and Peppers’ story but Pepper up & Wilder really ended the story for me. Like the rest of the series this book is not without its obstacles for this couple but the maturity in the characters was so refreshing. The friend aspect of this book was not as prevalent as past books but that is true to post college real life. Ali Dean did it again. This book was amazing. I'm not putting any spoilers out there but it was the best out of all of them. The perfect way to end it even though I hope it's not over. I love Pepper and Jace and this book just made me love them more. Ali Dean is amazing and everyone should read it. It's Pepper and Jace just being, well, Pepper and Jace. It's the book I didn't know I wanted to end the series. When I first heard of there being a sixth book in this series I was hesitant to read it because for me the fifth book seemed like a lovely, sweet ending and I was worried that this would drag on the story unnecessarily. However, quickly into reading this book I found out that I could not be any more wrong and I urge those with the same thoughts to just give this book a go as they won't regret it. Jace and Pepper are now in their 20's and have been married for 3 years however, with their differen When I first heard of there being a sixth book in this series I was hesitant to read it because for me the fifth book seemed like a lovely, sweet ending and I was worried that this would drag on the story unnecessarily. However, quickly into reading this book I found out that I could not be any more wrong and I urge those with the same thoughts to just give this book a go as they won't regret it. Jace and Pepper are now in their 20's and have been married for 3 years however, with their different sporting careers demanding so much of their time they've had little of it to truly settle in their marriage so this book discusses how they've coped and what they intend to do in the future. What I really noticed about this book is that while Jace and Pepper have grown up so has the content in the book. They've moved past the petty jealousy and are dealing with more 'adult' issues that I won't name due to spoilers but has really highlighted their character development over the 3 years that have passed since the last book. Although don't worry it wouldn't be a Pepper Jones book if she didn't have to ignore other girls trying to get the now very famous Jace. I loved how this book was both a sweet ending to the series but also dealt with some really heart wrenching issues that made me cry and laugh and realise just how mature they now are. They both haven't changed much considering Pepper is still considerate, kind and a little bit shy while Jace is still his confident, cocky self however, in a lot of ways they've changed immensely too. They've grown from their somewhat selfish teenage selves thinking about their own careers to mature adults wanting to settle down in their careers and live together in a place they can call home while considering the location based off of their partners. Wonderful finale for the Pepper Jones series. Pepped Up & Wilder is book six in the series. The conclusion to Pepper and Jace's love story. The duo are now currently in their 20's. Jace is in his second season of football with a professional football team the Browns. While Pepper a potential Olymic competitor is training/competiting around the world. The pair have been married for three years now most of it spent apart due to their hectic schedules. Will the distance cause problems or will it make the heart grow fonder? They both are striving for an end goal to be able to own a home back in their hometown and close to family. These two struggle to find the balance between their goals/careers and their marriage. Can they make it work? When an unexpected tragedy happens the two will have to fight with all they got to stay afloat. Will they be able to handle it? Or will it crush them apart? I wasn't sure what to expect from this new addition to the Pepper Jones series, but I definitely knew that I was excited for it. I always felt like there was just a little bit more of Pepper's story to be told and this book fit every expectation I didn't know I had. Perhaps the standout of this book is how solid Pepper and Jace have become as a couple. Marriage certainly agrees with them, even if their work schedules keep them from spending as much time together as they would like. Each faces th I wasn't sure what to expect from this new addition to the Pepper Jones series, but I definitely knew that I was excited for it. I always felt like there was just a little bit more of Pepper's story to be told and this book fit every expectation I didn't know I had. Perhaps the standout of this book is how solid Pepper and Jace have become as a couple. Marriage certainly agrees with them, even if their work schedules keep them from spending as much time together as they would like. Each faces their own career challenges, but the strength of their marriage keeps them from losing balance. In the past books, it felt like whenever Jace was low, Pepper was high, or vice versa. Now they are on the same page, riding the waves together and keeping honesty and love at the center of their relationship. The way they talk through their feelings and fears, each one willing to sacrifice for the other, is so special. The best part? It feels so authentic to their story and what they've been through together. Although the relationship plays a huge role in this story, let's not forget that Pepper is the heart of this series. Pepper never fails to inspire me, but in this book she shines. Her confidence, vulnerability, strength, and love comes together in a way that shows she is comfortable with herself, flaws and all. In particular, her racing scenes really explore the depth of her resilience. And let's not forget about our secondary characters! Both friend and foe, each interaction with the secondary characters adds to the overall plot. It's easy to get overcrowded with so many big personalities, but the balance in this book is perfect. We get to revisit some of our old high school pals and newer college friends and see how they're handling tricky adult friendships. Pepped Up and Wilder is an incredible addition, but it does get a little darker than its predecessors. We see Jace and Pepper at their most vulnerable while navigating indescribable hardship. However, the way they move through it together is nothing short of heartwarming. I'll say this, Pepped Up and Wilder will make you cry all kinds of tears, and you'll be thanking Ali Dean by the end. This is the sixth book in this series, it’s not a standalone, you must read the previous books as you would get lost off. Jace and Pepper are both following their dreams and working as professional athletes, but working and traveling puts a strain on their marriage. Both have demanding careers but are supportive of each other, though they both have moments of feeling lonely and missing the other. They both want to live back in their home town next to their family but have to work hard to make th This is the sixth book in this series, it’s not a standalone, you must read the previous books as you would get lost off. Jace and Pepper are both following their dreams and working as professional athletes, but working and traveling puts a strain on their marriage. Both have demanding careers but are supportive of each other, though they both have moments of feeling lonely and missing the other. They both want to live back in their home town next to their family but have to work hard to make that happen. An unexpected event puts more strain on the couple, making them work hard to find a happy medium and get their life together back on track. I enjoyed reading this final book in the series, I loved getting to see both Pepper and Jace mature over the course of this series, especially Jace he really comes into his own in this book. We get to catch up with past characters and meet some new ones, the reader is taken on an emotional roller coaster with this couple over the course of this series but more so in this book, we also get a wonderful epilogue. I do hope we get more from this couple, a fabulous end to this amazing series. Pepper and Jace are back and they are better than ever. It is hard not to fall in love with these two all over again. Pepped Up & Wilder is the final book in their story and there is nothing they can’t face together. We’ve been through so much together, I can handle anything. They don’t know who they’re dealing with. This book truly took my on an emotional roller coaster. I truly felt for Pepper, once you read the story you will understand, I don’t want to give any spoilers to it. I found my Pepper and Jace are back and they are better than ever. It is hard not to fall in love with these two all over again. Pepped Up & Wilder is the final book in their story and there is nothing they can’t face together. This book truly took my on an emotional roller coaster. I truly felt for Pepper, once you read the story you will understand, I don’t want to give any spoilers to it. I found myself laughing, crying, smiling, and just falling in love with every single character in this series all over it. Not only is the story beautiful and the perfect ending to the series, but I absolutely love Ali Dean’s writing style, there is something about it that draws me into the story and makes me feel like I am there. PLUS, I absolutely loved the epilogue to this story. It takes place 16 years in the future and we get a glimpse of what happened in their lives over the last 16 years. For anyone who is a fan of the Pepper Jones series this is one book that you won’t want to miss out on. 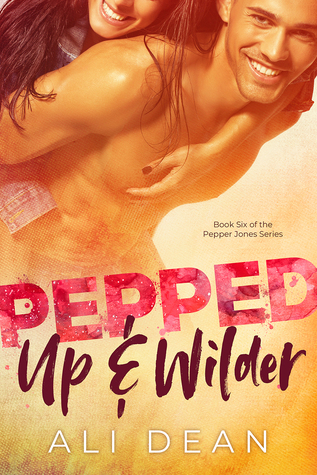 Pepped Up & Wilder by Ali Dean is book six in the Pepper Jones series and is not a standalone. You must read the books in order. The previous books are Pepped Up, All Pepped Up, Pepped Up & Ready, Pep Talks and Pepped Up Forever - available in a box set. Pepper and Jace's story continues. Both are married and have their own careers. Life could be good. But distance, insecurities and every days life create problems for them. They threaten to grow apart, create distance between them and som Pepped Up & Wilder by Ali Dean is book six in the Pepper Jones series and is not a standalone. You must read the books in order. The previous books are Pepped Up, All Pepped Up, Pepped Up & Ready, Pep Talks and Pepped Up Forever - available in a box set. Pepper and Jace's story continues. Both are married and have their own careers. Life could be good. But distance, insecurities and every days life create problems for them. They threaten to grow apart, create distance between them and something has to give. The question is who's to pay the price. The Pepper Jones books were the first books I have read from this Author. So I was extremely excited when I found out she was writing a new book with my favorite couple. Pepper up and Wilder was the perfect conclusion to this series. It had all the feels as well as Ali Deans talent for really displaying what these athletes go through. Her writing gets better and better and she really gives you that connection to the characters. This story takes place a few years after Pepped up forever. Both Jac The Pepper Jones books were the first books I have read from this Author. So I was extremely excited when I found out she was writing a new book with my favorite couple. Pepper up and Wilder was the perfect conclusion to this series. It had all the feels as well as Ali Deans talent for really displaying what these athletes go through. Her writing gets better and better and she really gives you that connection to the characters. This story takes place a few years after Pepped up forever. Both Jace and Pepper are a few years into their careers. They struggle with finding time with each other and finding a balance to thier marriage and thier professional goals. When tragedy strikes they need to hold strong to thier love for each other and learn how to live again and find the path that’s right for them. If you never read any of the Pepper Jones books, you’ll need to read the first 5 books before reading Pepped up and Wilder. Omg! I loved this book! It was definitely worth the wait! I just can’t believe it’s the last one. I’ve been with Ali since the very beginning. She is one of my go to authors. Her books never disappoint! With this book being the end of the series. I will say that I really enjoyed how both characters matured and evolved throughout this book and throughout the entire series. They definitely have they’re ups and downs that come with any relationship. But they overcome every obstacle and still manage Omg! I loved this book! It was definitely worth the wait! I just can’t believe it’s the last one. I’ve been with Ali since the very beginning. She is one of my go to authors. Her books never disappoint! Ever since finishing Pepped Up Forever, I have been wanting more Pepper Jones. So, you can only imagine my excitement when Ali made the announcement earlier this year. There’s no doubt that Pepped Up & Wilder had big shoes to fill, especially given that it is the final book in the series, and boy did it deliver. Having grown with the series, it was refreshing to see the maturity of the characters, which is something that I have been loving about Ali’s most recent books. While I am in no way opposed to more Pepper Jones in the future, I do feel that Pepped Up & Wilder was the perfect way to end Pepper and Jace’s story. I absolutely adored the last book in the Pepper Jones series. I feel like it was the perfect ending to a series and I wouldn’t have done anything differently. Having never read the series until this year, I feel like I was missing out! So I was glad I got catch up on them all in one setting. I feel like I got to watch my kids grow up. I saw them work through issues, go through the ringer and still somehow make it. Pepper and Jace work. No matter what they just do. This last book touched on a top I absolutely adored the last book in the Pepper Jones series. I feel like it was the perfect ending to a series and I wouldn’t have done anything differently. Having never read the series until this year, I feel like I was missing out! So I was glad I got catch up on them all in one setting. This last book touched on a topic that actually happened to me as well at around the exact same time it did for Pepper. I hadn’t realized how therapeutic it was for me to read through it until I was finished. I remembered those days and remembered the feelings but seeing how Pepper got through them reminded me how I did as well. I was able to resonate with her on so many levels (sadly not the Olympian one haha!) but as a woman, she is the one I want to be like when I grow up. To be honest I was a bit skeptical at the beginning, it was such a good series and I thought it was completed. But I loved Peper so much so I gave it a chance. And thank god I did, because it was just as good as the others in this series. I can honestly recommend this book, I absolutely loved it. Sometimes its a bit difficult to still find good books, if you read a lot like me. So when I find one I get completely lost in it. This also happened with this book. So many things happened that I didn' To be honest I was a bit skeptical at the beginning, it was such a good series and I thought it was completed. But I loved Peper so much so I gave it a chance. And thank god I did, because it was just as good as the others in this series. I can honestly recommend this book, I absolutely loved it. Sometimes it´s a bit difficult to still find good books, if you read a lot like me. So when I find one I get completely lost in it. This also happened with this book. So many things happened that I didn't expect at all. Read it, it´s absolutely worth it! Ali Dean has done it again! She writes some of the best characters ever and you can't help but fall in love with them. Then she puts them through the ringer. I cried for Jace and Pepper. I smiled when things went their way. I laughed when a character popped up from the past. This book was The perfect follow up to the series. The last chapter was the best part in my opinion. Seeing how everything ended made my day. I always say the Ali should put a disclaimer at the beginning of her books to earn Ali Dean has done it again! She writes some of the best characters ever and you can't help but fall in love with them. Then she puts them through the ringer. I cried for Jace and Pepper. I smiled when things went their way. I laughed when a character popped up from the past. This book was The perfect follow up to the series. The last chapter was the best part in my opinion. Seeing how everything ended made my day. So I started reading about Pepper and Jace in 2014. I have laughed and cried and yelled and have been mad reading about the two of them. This series has been a joy to read. I have loved reading the way the characters grow together and apart. Pepped Up and Wilder is one of my fave books about them. What Pepper and Jace go through is hard to read sometimes. They have managed to go through so much and still endure. Ali Dean you are an amazing author and I can’t thank you enough for the journey you So I started reading about Pepper and Jace in 2014. I have laughed and cried and yelled and have been mad reading about the two of them. This series has been a joy to read. I have loved reading the way the characters grow together and apart. Pepped Up and Wilder is one of my fave books about them. What Pepper and Jace go through is hard to read sometimes. They have managed to go through so much and still endure. Ali Dean you are an amazing author and I can’t thank you enough for the journey you included us the readers in. I was beyond thrilled to find out that Ali Dean was going to grace us with another book in the Pepper Jones series. Ali has a unique way of grabbing your attention and sucking you in from beginning to end with each of her books. This one was no exception to that. The storyline was great, engaging and provided me with all the feels. I love how we get to see Jace and Pepper's POV during certain aspects in this book as well. I always find it intriguing and refreshing when authors have the ability a I was beyond thrilled to find out that Ali Dean was going to grace us with another book in the Pepper Jones series. Ali has a unique way of grabbing your attention and sucking you in from beginning to end with each of her books. This one was no exception to that. The storyline was great, engaging and provided me with all the feels. I love how we get to see Jace and Pepper's POV during certain aspects in this book as well. I always find it intriguing and refreshing when authors have the ability and creativity to provide that to their readers. I love how Jace and Pepper's love for one another never falters and continues to grow, even when they face certain challenges that would probably cause some marriages to fail. Ali Dean has wrote another amazing edition to her series. I loved this book so much. I wish that there were more books planned to follow this group of friends lives. I love how the author keeps me so engaged throughout the book and series. If you love sports romance this book will not disappoint. I received an ARC copy of this book. I have been reading about these characters for years, and I love them so much! This whole series is one of my favorites! This was such a great ending to the series and it could not have ended more perfectly. I love Ali Dean's writing and her dedication to the characters. I am so thankful I discovered her years ago and was introduced to Pepper. I really love this whole story! Such a wonderful series. Ali hails from Vermont and now lives in Colorado with her husband, boy-girl twins, and golden retriever Pancake. Ali has always loved to read, but found that there weren't enough fiction books out there featuring girl athletes. So, she decided to work on that. Like the heroines in her books, Ali is an athlete, with running and skiing her favorite sports these days. When she's not pursuing an outdo Ali hails from Vermont and now lives in Colorado with her husband, boy-girl twins, and golden retriever Pancake. Ali has always loved to read, but found that there weren't enough fiction books out there featuring girl athletes. So, she decided to work on that. Like the heroines in her books, Ali is an athlete, with running and skiing her favorite sports these days. When she's not pursuing an outdoor adventure, Ali's less healthy passions include ice cream, coffee, and beer.